awesome skin superheroes into your skin naturally is through a high quality blend of oils like this one – even if you already have oily tendencies, it’s super quickly absorbed by hungry skin. The rosehip packs a punch of antioxidants and natural vitamin A which plumps out fine lines, while the jojoba penetrates deeply to nourish with essential fatty acids. Think of it as a green juice shot for your skin – just a few drops will do, then follow with your normal moisturizer and watch the glow develop. 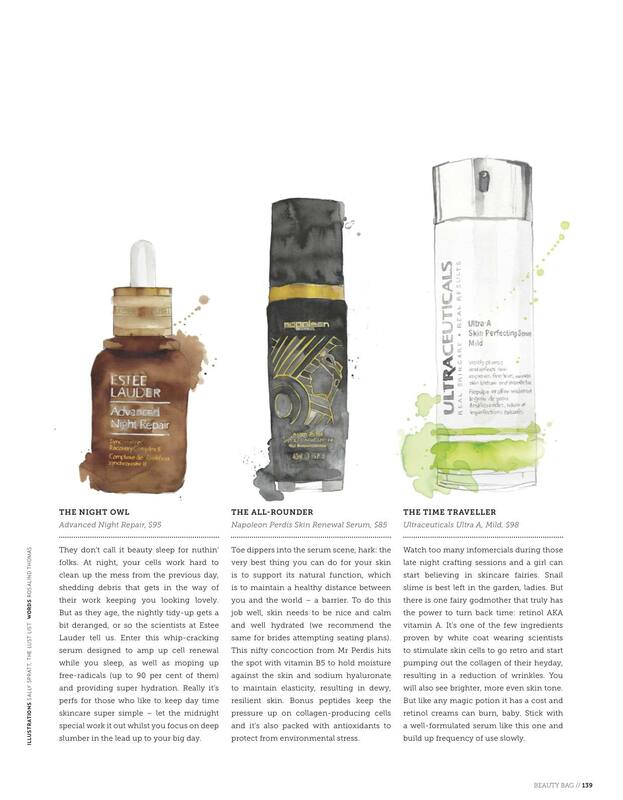 Toe dippers into the serum scene, hark: the very best thing you can do for your skin is to support its natural function, which is to maintain a healthy distance between you and the world – a barrier. To do this job well, skin needs to be nice and calm and well hydrated (we recommend the same for brides attempting seating plans).This nifty concoction from Mr Perdis hits the spot with vitamin B5 to hold moisture against the skin and sodium hyaluronate to maintain elasticity, resulting in dewy, resilient skin. Bonus peptides keep the pressure up on collagen-producing cells and it’s also packed with antioxidants to protect from environmental stress. Soooo, there’s this glow. It’s the in-love, best-day-of-my-life, cloud-nine glow. And it comes in a tiny jar (hoorah!) and you can guarantee it on your wedding day. There’s a pretty picture of it right above this writing, see? Vitamin C is a magic wand for radiance and this no-nonsense, high-potency formula developed by pharmaceutical company Obagi has the right concentration to brighten, fade pigmentation, plump up skin, and even boost collagen production without drying or irritating. And the notoriously fickle vitamin is well stabilized too. Combine this with the Time Traveller and you’ll be on your way to seriously amazing skin. Oh, and please do wear some sunscreen? Ta. The time: 4pm. The scene: your desk, littered with coffee cups and post-its, Pinterest minimised behind your Outlook and no evidence of lunch. The crime: severe dehydration and lack of bride-to-be glow. Your saviour? 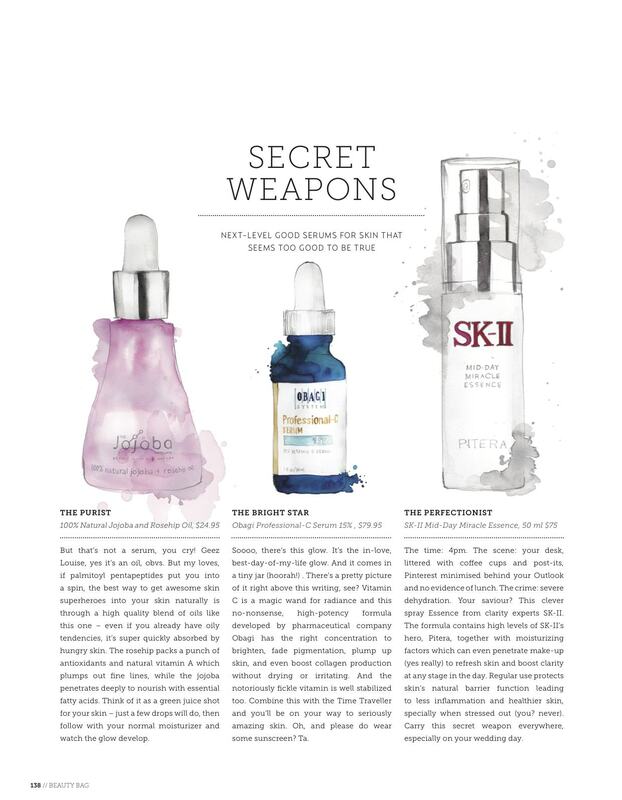 This clever spray Essence from clarity experts SK-II. The formula contains high levels of SK-II’s hero, Pitera, together with moisturizing factors which can even penetrate make-up (yes really) to refresh skin and boost clarity at any stage in the day. Regular use protects skin’s natural barrier function leading to less inflammation and healthier skin, specially when stressed out (you? never). Carry this secret weapon everywhere, especially on your wedding day. So this is basically genius. Sabrina Tan, a Singaporean marketing manager, was sick of piling a gazillion products into her carry-on as she zipped between time-zones and climates for work. Her skin was not impressed either. Couldn’t there just be one little bottle with all the good stuff inside? That could change up with the seasons or the scene? Well howdy do, Skin Inc. Go online, fill in the survey and the Skin Inc computer will compile a custom blend serum just right for you, your skin type, your freak-outs (Pigmentation? Spots? ), and your location. Perfect for jetsetters, streamliners, and fuss-free brides. And currently front and centre of this beauty writer’s cabinet. Watch too many infomercials during those late night crafting sessions and a girl can start believing in skincare fairies. Snail slime is best left in the garden, ladies. But there is one fairy godmother truly has the power to turn back time: retinol AKA vitamin A. It’s one of the few ingredients proven by actual white coat wearing scientists to stimulate skin cells to go retro and start pumping out the collagen of their heyday, resulting in a reduction in wrinkles. You should also see brighter, more even skin tone. But like any magic potion it has a cost and retinol creams can burn, baby. Stick with a well-formulated serum like this one from Ultraceuticals and build up frequency of use slowly.